What’s better than a little dessert after an incredibly filling burger meal? When Sliders Burgers and Belgian Fries opened in the Campus Pointe Mall near WMU, the same company also opened an Insomnia Cookies. 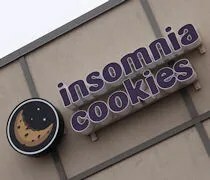 Insomnia Cookies is a late night cookie delivery bakery that is almost exclusive to college campuses. The Western Michigan University shop is the third one in Michigan. The other two are in obvious locations. One at Michigan State University and one at the University of Michigan. Insomnia is in a very small space right next door to Sliders. I’m fairly certain they just chopped up what used to be Real Deal: Classic Burgers and Shakes in to two seperate spaces for the two businesses owned by Serve U Brands. There’s a small order counter and a stand up bar on either wall. The menu is hung on the wall above the order counter. You can order your cookie individually or they have a couple of deals to on larger orders. 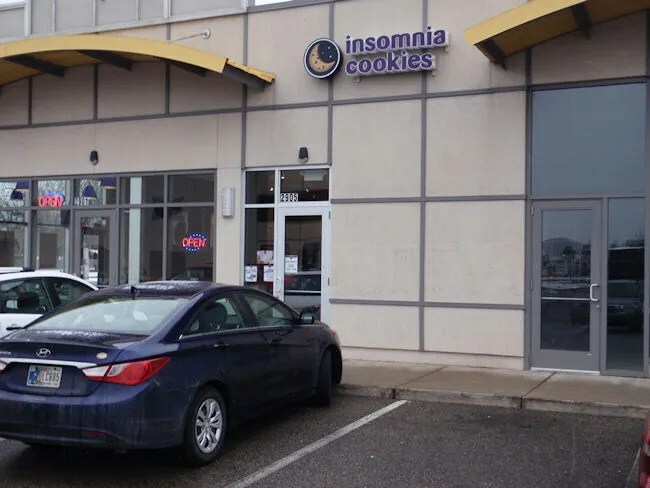 J and I have ordered cookies from an Insomnia Cookies before (when we lived in Lansing) and while the service at that one was horrible, we really liked the cookies. J was really looking forward to this Insomnia opening so close to home. Since we had just eaten lunch, we didn’t really need a whole lot of cookies, but we did want to pick up a couple each. One for now, one for later. L was starting to get a little restless, so J suggested I go get her hooked in to her car seat while she got the cookies. She got me two Chocolate Chunk cookies then got a sugar cookie and a double chocolate mint for herself. The cookies are taken right out of a warming drawer then put in to paper bags. I was a little ways down the road before I pulled one out of the bag to eat and it was instantly messy….in a good way. The cookie itself was warm and very soft. The chocolate chunks were all melty…which is what was causing the mess. 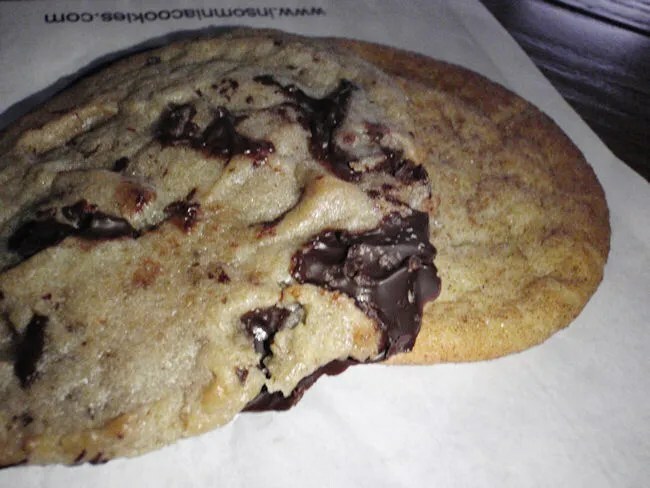 The warm, gooey cookie was insanely delicious. The bill for the four cookies was right around six bucks..which would have been the minimum order for delivery, but even though we live less than three miles from the store, we’re out of delivery range. I still see many nights where I will get a message from J asking me to pick up cookies on my way home from work and I will happily do so. The worst delivery service I have experienced. Has been over an hour and a half and still waiting for cookies. Good idea, bad execution. TERRIBLE!!!! Cookies were never delivered and had to fight for a refund and kept being told they were DELIVERED!!!! Great idea but awful experience from the initial ordering process on their website to dealing with customer service. I wil NEVER use them again. Very disappointed. BEWARE for a huge hassle when your cookies never arrive.